Ampicillin (Ampicillin) is in the aminopenicillin family of antibiotics. It works by preventing bacterial growth. This medicine is indicated for treating bronchitis, pneumonia, infections occurring in the ears, throat and nose, bacterial meningitis, peritonitis and other conditions that have not been listed here. Ampicillin (Ampicillin) is in the aminopenicillin family of antibiotics. It works by preventing bacterial growth. This medicine is indicated for treating bronchitis, pneumonia, infections occurring in the ears, throat and nose, bacterial meningitis, peritonitis and other conditions that have not been listed here. Medical studies have shown it to be effective against gram positive organisms including listeria monocytogenes, staphylococci which do not produce penicillinase, D. penumoniae and various others. Gram negative organisms it acts against include proteus mirabilis, N. meningitides, E. coli and others not listed here. This antibiotic works by inhibiting an enzyme called transpeptidase, which prevents bacterial cell wall production, thereby preventing the bacteria from growing. 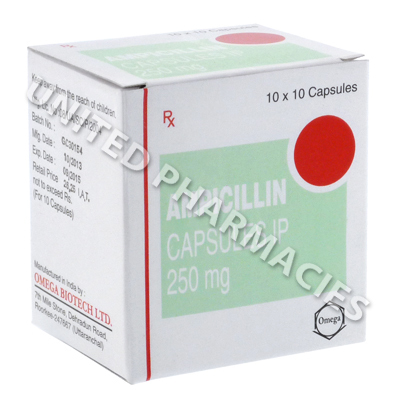 Ampicillin (Ampicillin) is provided as 250mg strength capsules for oral administration. If your doctor diagnoses your infection as having being caused by susceptible bacteria, a suitable dosage regimen will be determined, with your individual circumstances being taken into account. Adults undergoing treatment for a bacterial infection may be instructed to administer 250mg to 500mg (the exact amount will vary) without food, at 6 hour intervals. The dosage may vary depending on the type of infection. Because this medicine is used to treat gastroenteritis, skin infections, pharyngitis and other types of infection, the dosage will need to be individualised for each patient based on the condition and other factors. While you are being treated with this antibiotic medicine, it is important that you tell your doctor about any side effects which occur. If you experience seizures, skin blisters, aching or any other symptoms of a severe reaction, immediate medical help will be needed. When undergoing treatment with any antibiotics, it is necessary to keep taking it for the entire amount of time that your doctor prescribes (unless your doctor tells you to stop treatment for any other reason). This is because ceasing treatment too early could allow the symptoms of the infection to return due to the bacteria not being completely destroyed. Colds and flu cannot be treated with antibiotic, as they are caused by a virus. Always use Ampicillin (Ampicillin) as you have been prescribed by your doctor. Never self-medicate or change your dosage without first consulting your doctor. The correct dosage can vary depending on your health, medical history, and the severity of the condition being treated.